It’s been a few years since the lovely Xiao Long Bao washed up on our shores and ever since, it has been dominating the dim sum scene in Manila. But Xiao Long Bao’s reign is soon over because Sheng Jian Bao is here to claim the throne. Mai Wei Fang (pronounced my-way-fhang) is not your run-of-the-mill Chinese restaurant. You’re not going to find classics like Bok Choy with Oyster Sauce or Seafood Casserole here as those dishes actually hail from Southern China. Instead, what you’ll find are street food classics from Northen China (specifically from Shanghai) that are wheat-based, like Cong You Bing, Shao Bing sandwich, and You Tiao. Staying true to its name as Mai Wei Fang literally means ‘wheat mill room’. 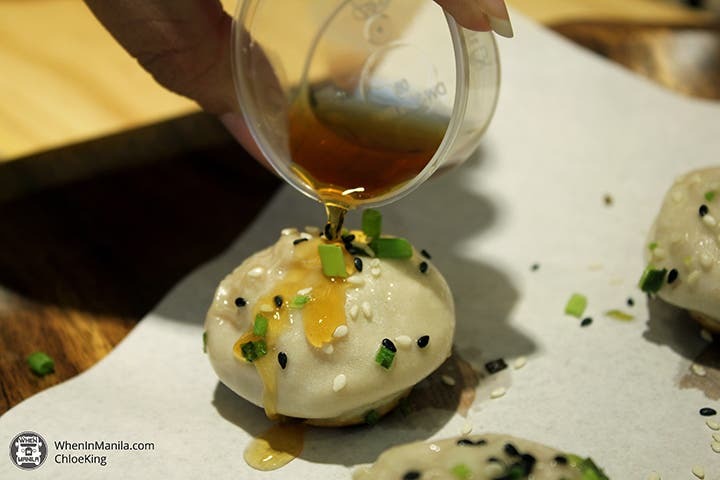 The star of the show is a perfect little dumpling called Sheng Jian Bao (Php165). It’s a small bite-sized dumpling made of pork meat filling wrapped in an unleavened dough. The magic happens when it is cooked by pan frying the bottom and steaming the top. The unusual process gives us a dumpling that is crispy at the bottom and soft and chewy at the top with a savory soup inside. Yes, you read that right, there’s soup inside. Eating Sheng Jian Bao is an experience in itself. When you eat it, you will immediately feel the crispiness of the dumpling, then the softness of it at the same time. And once you take a bite, flavor explodes inside as the soup oozes out of the Sheng Jian Bao. I probably haven’t done justice on how good it is. It’s definitely something you should try for yourself. The Sheng Jian Bao might be the lead actor, but the supporting cast is just as good. Some of my favorites from the menu are the Shao Bing Sandwich, and the You Tiao Dessert. The Shao Bing Sandwich (Php155) is composed of the Shao Bing which is a flaky flatbread broiled to perfection stuffed with scrambled eggs, green onions, pork floss, and their very flavourful take on Chinese Fried Chicken. It’s definitely a party for your taste buds. And for dessert, they have their You Tiao Dessert (Php 100) with freshly crushed peanuts and sweet milk sauce. You Tiao is their version of a Chinese doughnut. This dessert is for folks who enjoy something that won’t give them diabetes. It’s the perfect balance of peanut and sweetness along with the fluffiness and lightness of the You Tiao. Their scrumptious dishes are best paired with their in-house drinks. The Wintermelon Tea is great for those who crave the full flavor of a Wintermelon. Their soy milk will take you back to your childhood as it tastes like the soy they use in taho minus the arnibal to sweeten it. The best part about all of this is that it’s very affordable. All of these dishes are below 200 pesos! Talk about bang for your buck considering that all of the items are made fresh that day. Mai Wei Fang succeeds at elevating these dishes to a whole other level while keeping your wallet intact and your tastebuds happy.